Near East products can take you on a culinary adventure without every leaving your kitchen. Founded in 1962, Near East began as a 12 stool luncheonette counter and today is one of the most recognized brands of couscous on grocery shelves. Sure, we know them for their couscous and rice - but they also offer lines of pasta, falafel and taboule - and they've just introduced two new products to add to their lineup. 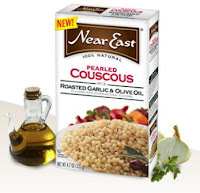 Near East Pearled Couscous brings the elegance of Mediterranean cuisine straight to your kitchen. 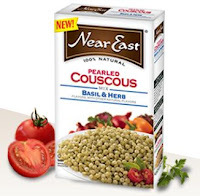 Near East Pearled Couscous, made with all-natural ingredients and Certified Kosher, is ideal for anyone looking for a flavorful and versatile side dish. It adds elegance to any meal in just 30 minutes. With ethnic food trends on the rise, Near East Pearled Couscous allows food lovers to cook up a taste of the Mediterranean at home. Near East Gourmet Meal Kits help create an upscale, yet affordable, dining experience at home. The Meal Kit provides ease in the kitchen with the casual elegance of a chef-made meal. It includes couscous, seasoning and sauce - just add chicken, water and olive oil for a gourmet meal. Sharing the experience of a well-made meal with friends and family is a celebration, but that doesn't have to mean spending a lot of money. Bringing a special occasion feel to your every day is that much easier with Near East's new Gourmet Meal Kits that can feed a tableful for less than $15.